As stated the authority of Scripture is non-existent for all Scripture is dependent upon God’s authority. 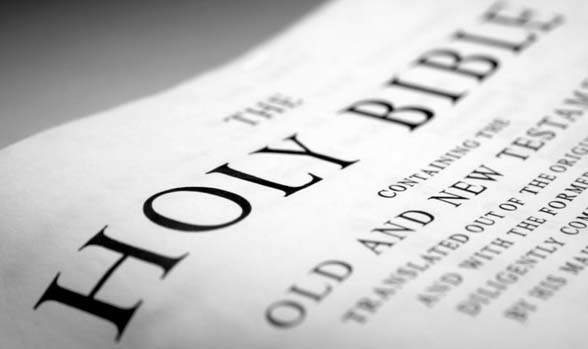 Scripture, however, is a witness to that authority of God and a vehicle of His authority. Scripture derives its power from the power and authority of God who worked through the inspiration of the Holy Spirit upon the men and women who wrote it conveying the story of God’s redemptive work in humanity. N.T. Wright paints the authority of Scripture as a Shakespeare play with five acts, but the fifth act is missing. The other four acts provide the plot and rich characterization of the play enough for those actors to write the fifth act and carry it out. If we are the actors who have been left with the writing of the fifth act then the Scripture is the other four acts, which is 1) Creation, 2) The Fall, 3) Israel, and 4) Jesus. +Wright states, “The church would then live under the ‘authority’ of the extant story, being required to offer something between an improvisation and an actual performance of the final act.” The authority of God playing through the first four scenes of Scriptures is our authority, and we must remain faithful to the story as told so far. This lends to Scripture its nature, which is narrative, and its inspiration from the Holy Spirit, which is God’s Words in man’s words. We must remember that Scripture is telling the story of God and humanity. “We read scripture in order to be refreshed in our memory and understanding of the story within which we ourselves are actors, to be reminded where it had come from and where it is going to, and hence what our own part within it ought to be,” writes +Wright. In what sense is the Bible the “Word of God”? Again, we must look back at the story being told. God’s authority is expressed in the story that is told by creation, the fall, Israel, and Jesus. God’s Word is God’s Story. It is not about whether or not something is literal or metaphorical, but about gaining a glimpse of the bigger picture. The story of re-creation through incarnation is found in the Scriptures. This story is written by the Most High God. The Scripture is one means of revelation for God. In Prop I of The Declaration and Address, Thomas Campbell writes, “That the Church of Christ upon earth is essentially, intentionally, and constitutionally one; consisting of all those in every place that profess their faith in Christ and obedience to him in all things according to the Scriptures, and that manifest the same by their tempers and conduct, and of none else; as none else can be truly and properly called Christians.” Mr. Campbell states clearly that the Scripture is the authority of the faith and should inform our practice of the faith. The practice of the faith boils down for Mr. Campbell those things that have are expressed terms and approved precedents. Article VI of the Articles of Religion state, “Holy Scripture containeth all things necessary to salvation: so that whatsoever is not read therein, nor may be proved thereby, is not to be required of any man, that it should be believed as an article of the Faith, or be thought requisite or necessary to salvation.” Mr. Campbell and Article VI are in agreement about Scripture being the primary source of our faith and our practice. The Scripture witness to God’s authority and also to the apostolic witness. In Romans 15:4 Saint Paul writes, “For everything that was written in the past was written to teach us, so that through endurance and the encouragement of the Scriptures we might have hope.” Saint Paul is making it clear that the Old Testament Scriptures were written to teach us. 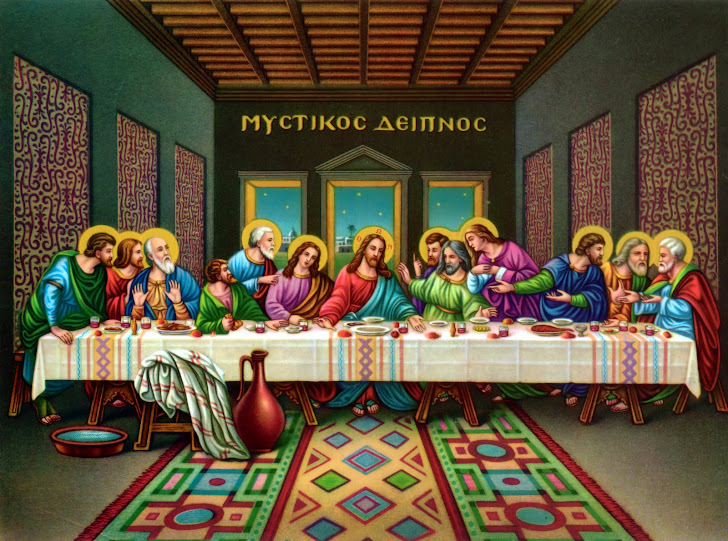 At this time the New Testament canon was not present, but the apostolic witness and Holy Tradition were clearly present both from historical and scriptural views. "History was where Paul looked to see the roots of the story whose climax he believed was Jesus Christ. History is where we have to go if, as we say, we want to listen to Scripture itself rather than either the venerable traditions of later church leaders or the less venerable footnotes of more recent scholars,” writes +Wright, “For too long we have read Scripture with nineteenth-century eyes and sixteenth-century questions. It's time to get back to reading with first-century eyes and twenty-first-century questions." The first key to hermeneutics is to understand the historical context. Too often we neglect to place ourselves in the shoes of the audience of the first century and ask how that applies to us today. Alexander Campbell writes, “The words and sentences of the Bible are to be translated, interpreted, and understand according to the same code of laws and principles of interpretation by which other ancient writings are translated and understood.” Campbell’s hermeneutical principles are as follows: 1) Historical circumstances (order, title, author, date, place, and occasion), 2) Who wrote it and to whom did he write, 3) Language interpretation used for other books are applied to the Bible, and 4) Common words with one known meaning the interpretation is clear; words with more than one can have no clear interpretation. Being Anglo-Orthodox I adhere to Scripture, Holy Tradition and Reason when it comes to hermeneutics. Dr. William DiPuccio writes, “Orthodoxy sees Tradition as an organic whole (one source theory) which includes Scripture. Tradition, then, functions as the hermeneutical lens through which we understand the Bible. It is a safeguard against the kind of free-for-all interpretation that permeates many mainline churches today. When approaching Scripture, it is better to trust the collective wisdom of the ages than the myopic vision of contemporary individuals or groups.” I believe this lays a solid foundation for hermeneutics. The problem with Protestantism is that it put a Bible in everyone’s hands and told them to read it and come to their own conclusion hence the 32,000+ Protestant denominations that we see today. This does not make Scripture subservient to Holy Tradition. The Fathers would have held that a true interpretation would lead one to the Tradition, which was the flagship of the Faith. “In their quest to reach culture, evangelical congregations have come to reflect the cultural preferences of their audience: anti-institutional, informal, nondogmatic, therapeutic, and unaware of the difference between tolerance and moral confusion,” writes D.H. Williams. I think Mr. Williams is on to something with his statement. I have not met anyone who supports homosexuality, abortion, or heretical teachings like that of John Spong who have a high view of the Scriptures. The problem we face is the post-modern revisionism, which is full of moral relativism and pluralism. To fit into the society many churches have brought their view of the Scriptures low in order to make allowance for things such as homosexual partnerships that are blessed by God. We have to remember what N.T. Wright wrote about writing the fifth act of the play and how we must remain faithful to the first four acts. This is the place of Scripture, which is a witness to God’s authority and a vehicle of God’s authority. This is just a simple paper assigned after a introductory study of postmodernity and the current cultural shifts and a reading of The Younger Evangelicals by Robert Webber. This paper is not designed to be very formal containing a thesis and points. It is merely a personal reflection upon 5 cultural shifts that are opportunities for the Church, 5 cultural cultural that are a danger to the Church, and 5 ways I want to create ministry in this cultural context or how to carry out ministry. Hope you enjoy. Dr. Carlus Gupton writes, “Our time is best described as transitional, a very fluid moment where previous ways of understanding the world and functioning within it are increasingly abandoned, yet without clear definition of what will replace it. Something has ended, but the new beginning has not yet taken shape, thus we are in the uncomfortable wilderness, the neutral zone.” The Church is living in a day and age where absolutes are being denied and truth is relative. This day and age of Postmodernism can present to the Church opportunities to ministry and dangers to the Church’s ministry to preach the Gospel and be a hospital for the sick sinners. Robert Webber writes, “The younger evangelicals are conscious that they grew up in a postmodern world. One younger evangelical writes of ways postmodern thinking differs from modern thought. Postmoderns ‘no longer feel a need to bow the knee to the modern God of rationality.’ Postmoderns, he argues, ‘have a much broader conception of what counts as reason’ because they acknowledge that ‘all rationality (religious, scientific, or whatever) is laden with faith.’ Postmodern young people recognize that ‘thinking is highly indebted to others.’ Therefore, the younger evangelical rejects the modern notion of individualism and embraces community. And to be postmodern in a Christian way is ‘to embrace the kingdom of God and renounce the values of the world.’” This is the first opportunity presented to us to witness to people. This opens the door that Protestantism with its emphasis on the rational had closed and that is the door to sacramentalism or a sacramental world-view. For too long reason has dominated the Church. “The postmodern September 11, 2001, world has led to the recovery of the biblical understanding of human nature. The language of sin, evil, evildoers, and a reaffirmation of the deceit and wickedness of the human heart has once again emerged in our common vocabulary,” writes Robert Webber, “The liberal notion of the inherent goodness of humankind and the more recent evangelical neglect of the language of sin and depravity have failed to plumb the depths of the wickedness that lurks in the human heart. The younger evangelical approaches humanity with a more realistic and biblical assessment of our estrangement from God.” This presents the Churches second opportunity to present the Christian meta-narrative of the Creation, the Fall, Israel, and Jesus Christ. This allows for the Church to tell Her story of redemption and how She has been made a part of the re-creation attempts of God. Pragmatic Evangelicals, seeking to draw in seekers (no pun intended), neglected to preach about the wickedness of men and the depths of humanity’s depravity. David Crowder, of The David Crowder*Band, put it this way: “When our depravity meets His divinity it is a beautiful collision.” This cultural shift allows for a sacramental understanding of the Cross and Resurrection to take place. The shift allows for the preaching of humanity’s depravity coming into collision with God’s divinity, which overcomes the wickedness and clothes the redeemed in the Divine Nature (II Peter 1:4-5). The Church can present the story of the Fall, but that there is more to life. That there is a door for humanity to be ontologically changed, transformed back into an original state of glory. David Horseman writes, “"Theosis is neither a mere psychological change nor a simple behavioral change. It is both, but not in a superficial sense. These changes of thought and behavior are but the indices of a deeper, ontological change, in our nature, a sharing of the divine nature, in which we become more and more like God, changed from glory into glory, until the day of our final redemption..." This could be the story we tell with this change in culture. The third opportunity presented by this cultural shift is in the context of evangelism. The Next-Wave web magazine states of younger evangelicals’ desire “is to see people enter a relationship with Jesus Christ. Receive His forgiveness, enter His community with the saints, worship in ways that are meaningful to them, and reach out to others in their world.” Robert Webber believes that the new landscape of the culture will provide a new type of evangelism that is ancient-future evangelism. The old is that the Church must emphasis a personal regenerative relationship with the Triune God via Christ, but the new is the context in which the Church worships and facilitates community that is missional. This aura creates an opportunity for the Church to fashion a community focused on relationships of reconciliation: relationships with humanity and with God. The Gospel is presented through relationship primarily. A good model of evangelism in the postmodern world would be: dialogue, demonstration, declaration, and defense all lived out incarnationally. The Church’s fourth opportunity within this cultural shift is to begin to see Christianity as more than a world view. Robert Webber writes, “Today the younger evangelical questions the priority given to Christianity as a worldview. Younger evangelical Charles Moore writes, ‘The idea of Christianity as a worldview is essentially Gnostic. It makes Christianity a idea, a philosophical viewpoint, a construct. Christianity is primarily a kingdom, an embodied reality and is more about a faithful discipleship than affirming an intellectual construct.’ Moore argues that making Christianity a worldview ‘abstracts reason from history and pits the existing, choosing subject against the object. It reduces Christianity to metaphysics.’” This part of the cultural shift is very important to the life of Christianity because seeing the faith as something to be believed, rationed, and defended can leave it shallow and empty for there is no living it out. Christianity is primarily relational and has to be incarnational in this world. The Church can benefit with this ideological shift because it allows the Church to embody Christ and be formed to His image and live as He lives. “The Christianity Today articles reported that ‘postmodern Christians are trying to redefine the relation of faith and knowledge, that instead of coming to the faith rationally, true knowledge requires the Holy Spirit to work an ontological change in the human heart,’” writes Robert Webber. He goes on to clarify that this is not a new approach, but that younger Christians are deconstructing in order “to reconstruct an historic life of the mind”. The road to the future lies in the past. The Church has an opportunity today to revisit the past with the Creeds, the Church Fathers, St. Aquinas, and St. Augustine and let that ancient wisdom shape and mold the way the Church carries out faith and practice. The number one thing for the Church to distinguish in the cultural shift of postmodernity is that there are two schools of postmodernity: soft postmodernity and hard postmodernity. Milliard Erickson, in Postmodernizing the Faith, writes, “Hard postmodernism, best represented by deconstruction, rejects the idea of any sort of objectivity and rationality. It maintains that all theories are simply worked out to justify and empower those who hold them, rather than being based on facts. It not only rejects the limitation of meaning of language to empirical reference; it rejects the idea that language has any sort of objective or extralinguistic reference at all. It moves from relativism to pluralism to truth. Not only is all knowing and all speaking done from a particular perspective, but each perspective is equally true or valuable. The meaning of a statement is not to be found objectively in the meaning intended by the speaker or writer, but is the meaning that the hearer or reader finds in it. ‘Whatever it means to me’ even if it is quite different from what it says to you.” The Church has to remember that wonderful idea by Blasé Pascal that there are two dangerous extremes shutting reason out or letting nothing else but reason in. The pluralism of today’s society is dangerous to the truth of the Gospel. The Church must defend the truth of the Gospel and learn to evangelize to a pluralistic society instead of assimilating into society. Religious tolerance is the second danger. Dr. Gupton writes, “No religion should be thought of as superior to another. Indeed, this belief in superiority is the major roadblock to religious unity.” This hard postmodernism belief is very dangerous to the truth of the Gospel. The Church believes that She has an exclusive claim on the Truth, which She must stand by and defend. The third danger of hard postmodernism found in this cultural shift is in the area of evangelism. Dr. Gupton writes, “Proselytizing is bigotry, pure and simple. The idea of winning converts is based on the antiquated notion that one religion has more to offer than another. Our task is to help others discover the hidden inner meaning of their religions, rather than convert them to our own.” This is something the Church must absolutely reject to defend the Gospel. Only through Christ is forgiveness of sin offered and deification began. Other religions contain some universal truths, but do not contain the Truth found in the Gospel presented by the Church. The fourth danger the Church must be careful to be aware of moral relativism or moral pragmatism. Easum writes, “In the new emerging society right and wrong will not exist. Whatever benefits the individual will form the basis for ethics.” The Church has to come to the defense of morals and ethics. The problem with hard postmodernism is that it deconstructs to the point of chaos, which cannot be upheld. This is no accountability of ethics, but the Church can account for its ethics, which stem from God and absolute truths. Society and individuals are a dangerous grounds upon which to build what is moral, right, or just. The fifth danger to the Church is privatization. The Church must be careful to fight against this idea that faith, too, can be privatized and individualized. The Church must maintain a strong emphasis on communal living both at home and in ecclesiastical settings. Easum writes, “People are preoccupied with themselves. Whatever is done behind closed doors is considered acceptable conduct. Privacy is the ultimate price…The majority of people will tend to withdraw physically and psychologically.” This is the danger to a incarnational people called to be God’s hands and feet in the world. 1. Even though I am the priest and carry out all the sacramental duties I want to approach leadership as a team effort with all the members of the parish helping to carry out the duties of the church. Ministries may not always come from the leadership team, but from within the congregation who feels lead to start up a ministry. Christ is the head of the Church and I am a part of that thus He moves mysteriously and powerfully in all our lives in the parish. 2. Life is about relationships. My life motto is “I am a person of worth created in the Image of God the Father, the Almighty, to live, to love, and to commune with fellow humankind and with the Blessed Trinity.” This is how I want to carry out ministry in the church. Programs, as Eric says, “are means not ends.” Everything thing we do ought to be to foster community and relationship and not just to learn and do. Developing close, healthy relationships is the focus within the postmodern context I want to employ. 3. 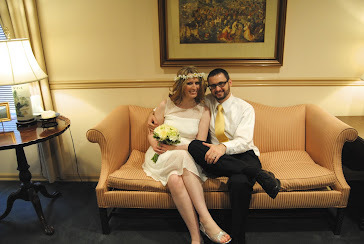 Eric writes, “Be authentic. Don’t pretend you’ve got it all together, spiritually or otherwise. Admit your mistakes and struggles, for then we can work on them together. No posers allowed.” I believe this is core to who I am. I strive to be real and authentic. I am drawn to real and authentic people, so I want to be a part of a community that emphasizes that over excellence or perfection, but wants to strive towards those together. 4. The emphasis is not on contemporary, but on ancient-future. I want to help create a community that is up-to-date, but realizes the power of ancient Christianity and Her traditions especially in terms of liturgy and spirituality. 5. I want to help create a community that honors “intellect and emotions, doctrine and intuition,” as Eric states. I want to take an holistic approach to faith and life. I want to focus on the power of the story that Christianity tells: Creation, Fall, Israel, Jesus. I see it often as a five act Shakespeare play that has last the fifth act thus we are left to write the fifth act on our own according to the authority of the other four acts. Our stories should come inside of this grand story. 6. I want to create dialogue and relationship between Catholics, Protestants, Anglicans, and Orthodox. There is no us vs. them in regards to other denominations or in regards to non-Christians. Christians and non-Christians often face the same issues and have the same questions. I want to open our doors to all and have to come experience community and maybe even belong, believe, and behave instead of behave, believe, belong. It is about cooperation and not competition or condemnation. "Mary’s divine motherhood broadens the Christmas spotlight. Mary has an important role to play in the Incarnation of the Second Person of the Blessed Trinity. She consents to God’s invitation conveyed by the angel (Luke 1:26-38). Elizabeth proclaims: 'Most blessed are you among women and blessed is the fruit of your womb. And how does this happen to me, that the mother of my Lord should come to me?' (Luke 1:42-43, emphasis added). Mary’s role as mother of God places her in a unique position in God’s redemptive plan. Without naming Mary, Paul asserts that 'God sent his Son, born of a woman, born under the law' (Galatians 4:4). Paul’s further statement that 'God sent the spirit of his Son into our hearts, crying out "Abba, Father!"' helps us realize that Mary is mother to all the brothers and sisters of Jesus. Some theologians also insist that Mary’s motherhood of Jesus is an important element in God’s creative plan. God’s 'first' thought in creating was Jesus. Jesus, the incarnate Word, is the one who could give God perfect love and worship on behalf of all creation. As Jesus was 'first' in God’s mind, Mary was 'second' insofar as she was chosen from all eternity to be his mother. The precise title 'Mother of God' goes back at least to the third or fourth century. In the Greek form Theotokos (God-bearer), it became the touchstone of the Church’s teaching about the Incarnation. The Council of Ephesus in 431 insisted that the holy Fathers were right in calling the holy virgin Theotokos. At the end of this particular session, crowds of people marched through the street shouting: 'Praised be theTheotokos!' The tradition reaches to our own day. In its chapter on Mary’s role in the Church, Vatican II’s Dogmatic Constitution on the Church calls Mary “Mother of God” 12 times." "Other themes come together at today’s celebration. It is the Octave of Christmas: Our remembrance of Mary’s divine motherhood injects a further note of Christmas joy. It is a day of prayer for world peace: Mary is the mother of the Prince of Peace. It is the first day of a new year: Mary continues to bring new life to her children—who are also God’s children." “The Blessed Virgin was eternally predestined, in conjunction with the incarnation of the divine Word, to be the Mother of God. By decree of divine Providence, she served on earth as the loving mother of the divine Redeemer, an associate of unique nobility, and the Lord’s humble handmaid. She conceived, brought forth, and nourished Christ” (Dogmatic Constitution on the Church, 61). Our Blessed Mother's faith was strong and demonstrated in the words, "Be it done unto me according to Thy word." She never hestitated to do the will of God. In the face of all the public shame she kept her faith and became selfless in her love! May we learn from her example and seek to become faithful as she was faithful to her precious Son, our Lord and Savior, Jesus Christ. She is considered the first Christian, in my understanding, due to her faith in her Son. May we learn from our Blessed Mother, the Holy Theotokos, to keep the faith and remain selfless in our love of Jesus. O Mary, Blessed Mother of God, pray for us and strengthen us. It is truly meet to bless you, O Theotokos, who are ever blessed and all-blameless, and the mother of our God. More honourable than the Cherubim, and more glorious beyond compare than the Seraphim, you who without stain barest God the Word, and are truly Theotokos: we magnify you. I've become very passionate about preaching the Book of Revelation once I'm ordained as a priest one day. This is often a book used by many as a scare tactic! It is a shame to see the Word of the Lord used to scare people out of hell or used as a beating tool across people's heads to scare the crap out of them! This stigma I think is the cause of why so many ignore preaching this book. In my young life I can recall just one sermon I have heard on Revelations. What I love about Koester is that 1) He begins with all the ways of interpretating this book and their positive/negative traits and 2) He spends the rest of the book presenting a Late-Date Preterist/Futurist Amillienial with High Eschatology view of the Book of Revelation, which is the view I hold to as well. This view simply means that we believe the book was written by St. John in the 90s A.D. Preterist means "past", so we believe most of the book's events have already been fulfilled or passed, ultimately in the destruction of Rome. Futurist means we hold that the ending chapters of the book, Jesus' return, have yet to be fulfilled. Amillienial means we do not interpret the 1,000 year reign of Christ as literal, but symbolic just like much of the numbers and that we are in this age right now and have been since Christ's death, burial, and resurrection. And we have a high eschatological view of Revelations meaning that we do find it to be prophetic and apocylyptic. 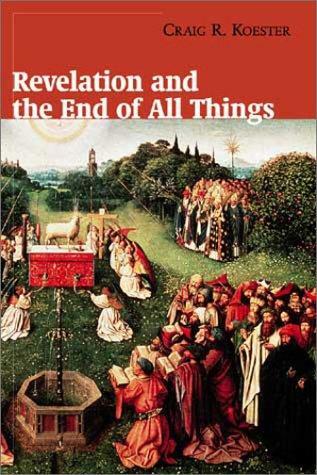 “Embarking on a study of Revelation is one of the most engaging ventures in Biblical studies,” says Mr. Koester in the preface of Revelation and the End of All Things. He goes on to write, “Interest in Revelation is perennially high even among those who do not otherwise give much attention to questions of Biblical interpretation. Curiosity is fed by the popular use of Revelation in print, film and other media.” Mr. Koester goes on to write that his book has come out of many years of studying, teaching, and preaching the book of Revelation. From this point Mr. Koester says he does not want to ignore the popular interpretations of Revelation, but wants to discuss each of them and how they work and why they are also problematic. The rest of the book divides Revelation into sections and study each carefully. Mr. Koester writes, “The goal is to present the message of Revelation in a manner that is accessible, engaging, and meaningful to modern readers, while taking account of the best in recent scholarship. The first chapter of the book is called “Interpreting the Mystery”. Basically Mr. Koester goes throughout history and outlines some of the major interpretations and approaches of interpretation for the book of Revelation. He begins with the Church Fathers such as Justin Martyr, Irenaeus, and moves on up to Jerome and Augustine and Luther. Mr. Koester then goes into many of the different approaches to interpreting the book such as Premilliennialism, Dispensationalism, and Postmillennialism. Mr. Koester at the end of this chapter then goes on to explain how he will approach interpreting Revelation. He writes, “Reading Revelation as a whole shows that the book moves in a nonlinear way. This insight goes back to the third century, when Victorinus wrote the earliest existing commentary on Revelation, and many recent interpreters have found this approach helpful. An outline of the book looks like a spiral, with each loop consisting of a series of visions: seven messages to the churches (Rev. 1-3), seven seals (Rev. 4-7), seven trumpets (Rev. 8-11), unnumbered visions (Rev. 12-15), seven plagues (Rev. 15-19), and more unnumbered visions (Rev. 19-22). Visions celebrating the triumph of God occur at the end of each cycle (4:1-11; 7:1-17; 11:15-19; 15:1-4; 19:1-10; 21:1-22:5)” (page 39). The first cycle is the messages to the seven churches. Although in this cycle there does not seem to be a lot of action or drama it is a very important cycle. The key to reading Revelation and gaining a deep grasp on its symbols and meanings is reading it in context and what it meant for 1st Century listeners. Understanding how this cycle works is key to understanding all the visions that come later in the book. Mr. Koester points out for us that John’s visions do not float freely up to heaven, but have a deep meaning for those on earth engaged in a struggle of faith. It is important to note that Revelation “is not so much designed to dispense information as it is designed to strengthen the readers’ commitments” (page 44). The book was written to stir readers out of their compliancy or comfort those who are in times of persecution. Also, it is highly important to recognize that this book was written to seven specific churches, but in using the number seven to represent wholeness and completeness John intended this to be for the whole church. There is something for us all to take away from the book of Revelation. The vantage point of the second cycle, which takes place in chapters 4 through 7 is from the throne of God. John wants the readers to look out upon their world and its affairs from that stand point. This cycle speaks of the Sovereign God. This cycle opens with praise and adoration of God and closes with the same. This cycle continues with the scroll that is sealed and that no one is worthy to open. John is quite disappointed, but then the Lamb is the one worthy to open the scroll. For the Lamb has conquered, the Lamb is Christ. Christ opens each of the seals. The events that follow are not about predictions per se, but about larger visions. The four horsemen would represent conquest, violence, economic hardship, and death. These are all authentic threats for the first century readers and for those after, even us. Mr. Koester writes, “The principal purpose of the visions in Revelation 6 is to awaken a sense of uneasiness in readers by vividly identifying threats to their well-being. The four horsemen are designed to shatter the illusion that people can find true security in the borders of a nation or empire, in a flourishing economy, or in their own health” (pages 81-82). In this new cycle, we begin with seven trumpets being blown. They interpret the silence that we saw in the seventh seal from the last cycle of visions. John directs us to these seven angels blowing their trumpets bringing in even more chaotic visions then the ones before. “With each successive scene, disaster strikes earth, sea, and sky, until demonic hordes of locusts and cavalry torment humanity amid clouds of fire, smoke, and sulfur,” writes Mr. Koester (page 93). Mr. Koester writes, “The visions in Revelation 8-9 do not convey information that allows readers to discern how soon the end of time will come, but they do issue warnings that are designed to bring repentance” (page 93). The visions are meant to bring about penitence. The Beast and the Lamb of Revelation 12-15 are the next cycle for us. This cycle begins to paint the graphic picture of the battle between good and evil, which ends with God and goodness trampling over evil and Satan. This cycle contains a messianic war that extends from the time of Christ’s incarnation up until His Parousia. We all live in the middle of this time frame and while here we have many things competing for our loyalty. I would say that the point of this cycle of visions is that if we are faithful and loyal to our Lord that we will overcome the evil we witness and endure. And in the end we will stand in heaven and sing praises to Him forever and ever. The next cycle begins with the seven bowls of judgment being poured out upon the earth. This cycle is about the Harlot and the Bride. In this cycle the Harlot is destroyed and all who worshiped her mourn. But God’s people rejoice and praise His name in the end of this cycle. In the final cycle we witness the binding of Satan and the defeat of the Beast and False Prophet. During the reign of Christ, Satan has been bound, but at the end of this reign Satan is released to once again deceive many and mount an army against God and His people. In this battle evil is conquered and after the New Jerusalem descends and God reigns from earth. I have gained a lot of insight from both reading this book and attending this class. I came here as someone who grew up in a very fundamentalist area where Dispensationalism is heavily taught and Left Behind is God’s modern word for Revelation. I came here believing that those books pretty much portray how it really will all go down in the end. I have come to find that those are far from the truth and represent a view soaked with sensationalism and emotionalism. I have come to see from reading this book and taking the class that I do consider myself a Late-Date, High Eschatology, Preterist-Futurist Amillienialist. I have learned a lot about how to view this book and interpret it through the eyes of 1st century Christians, but with 21st century questions as N.T. Wright would say. Mr. Koester has helped me to place Revelation in the 1st century and to read it as a whole and not as a linear type book. He has also helped me to understand some part I did not fully know how to understand before reading. I have always struggled with the notion of the Beast, the False Prophet and such. Coming from a background that I came from I had a tendency to wonder who those represented. Having learned to read this book in the way 1st century readers would have helps me see how this is Rome and the Imperial Cult. Another great contribution to my understanding is how much of Revelation can actually apply to us today! There are several applications we can take as part of the American Church. One thing is the extremely close ties we as a Church have with our government. I think we rely on our government to do our job for us and to carry out our duties. I think that Revelation should awaken us from the thinking that the Empire can keep us safe and secure. I also think we can be awakened from our complacent attitudes because of the great wealth we have here. Overall, I think Revelation should be taught and preached through lens such as this book more often! Jon Foreman once said, "There's only two ways out of this world and neither of them are safe..."
We could die now. We could die to ourselves...to our flesh. It is in dying that life is born. It is in crucifixation that resurrection springs forth. It is in the empty tomb that purpose is found. Christ said He came to give life and give it ABUNDANTLY! Why do so many of us never come alive? I think what Doc Reece said about our wanting cheap grace hits the nail on the head! We want to simply be justifed. We're okay with justification, but where is the longing for sanctication? We cannot have the life Christ gives if we are in charge of our own little worlds can we? And realizing we aren't in charge is first. There's nothing we can do on our own or by our own merit that promotes Deification. I don't want to make this sound like we are the ones doing this. Only the Holy Spirit can transform our lives and perhaps with our not even realizing He is at work. Our job is to be willing and participate with Him through the disciplines in the work He wants to do. My friend David said, "In fact even if not in awareness Santificication begins with Chrismation and indeed the response of surrender is initiated by the Holy Spirit endwelling us -- We can 'work out our own salvation' ONLY BECAUSE, as Paul says 'God worketh in us both to will and to do.' I have a concern about reliance on felling or awareness. God works at depths where we are hardly aware." But can we fully come to life when the programmer at the center of our beings is our Self? The thing about dying to yourself is that when you get up on that Cross and you die to the Self, Christ comes in and lives! 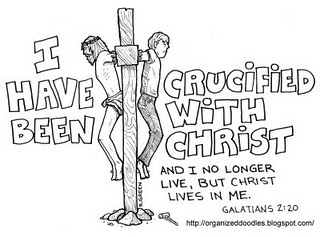 St. Paul says in Galatian 2:19-20, "I have been crucified with Christ; it is no longer I who live, but it is Christ who lives in me. And the life I now live in the flesh I live by faith in the Son of God, who loved me and gave himself for me." St. Paul is saying he got rid of the old programmer, his Self. He let Christ come in and live through Him. 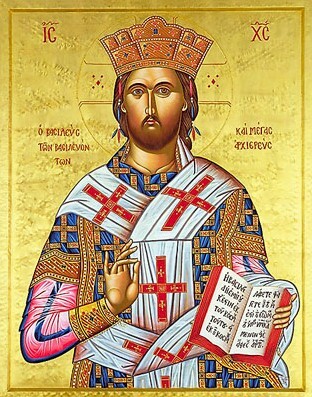 Christ is eternally begotten of the Father: God from God, Light from Light, True God from True God, begotten, not made, of one being with the Father. Hence when we die to our Selves we have a new past, present, and future because we take on His eternal transcendence! We take on His life for our old life is gone, it's dead...CRUCIFIED. Dying is a daily and life long process. Jesus Christ said, "‘If any want to become my followers, let them deny themselves and take up their cross daily and follow me. For those who want to save their life will lose it, and those who lose their life for my sake will save it." Christ has called us to pick up our crosses, deny ourselves, and follow Him. What did Christ do with His Cross again? Oh yes, He got up on it and died! Who are we to expect that we shouldn't follow Him in death. Did not St. Paul say in Romans 6, "For if we have been united with him in a death like his, we will certainly be united with him in a resurrection like his. We know that our old self was crucified with him so that the body of sin might be destroyed, and we might no longer be enslaved to sin. For whoever has died is freed from sin. But if we have died with Christ, we believe that we will also live with him. We know that Christ, being raised from the dead, will never die again; death no longer has dominion over him. The death he died, he died to sin, once for all; but the life he lives, he lives to God. So you also must consider yourselves dead to sin and alive to God in Christ Jesus." He says in Romans 8, "But if Christ is in you, though the body is dead because of sin, the Spirit is life because of righteousness. If the Spirit of him who raised Jesus from the dead dwells in you, he who raised Christ* from the dead will give life to your mortal bodies also through* his Spirit that dwells in you." Herein lies a GRAND and GLORIOUS TRUTH: That the Almighty and Living God dwells within us. The Divine resides in our hearts, His mercy seat. WOW! I don't know about you folks, but that is a mind-blowing truth! That the Creator of all and the Sustainer of all life resides in us! And if we die to our Selves then that same Spirit will bring us life, an abundant life full of joy and goodness. Haven't you had enough of trying to live on your own? Do you feel how dead we are when we are the captains of our own souls? St. Paul said in II Corinthians 4:11, "For while we live, we are always being given up to death for Jesus’ sake, so that the life of Jesus may be made visible in our mortal flesh." We are Imago Deo! So why aren't we dying to our Selves and letting the Spirit of Christ live in us? Why do we settle for the mediocre? Why do we settle for the garbage of living our lives on our own? Why do we settle for the trivial? When we're the programmer life is not going to be what it is supposed to be. Do you feel alive? Do you survive or do you want to THRIVE? I want to come alive. O sleeper, arise from your grave. There is a longing within us ALL to live and live fully. Christ has made this possible for us. If only we get up on our crosses and die the death He died so that we can live the life He lives. There is hope for real life full of purpose and meaning and joy. Raise your Ebenezer, your stone of hope this day. Don't merely stop at the foot of the Cross, get up on it you weary traveler! Put the nails in your hands and feet. Put your Flesh to death. "For to me, living is Christ and dying is gain..." says St. Paul. I'm ready to die. I'm ready to put the Self to death. I'm ready to partake of the Divine Nature St. Peter speaks about in his epislte. And this summer I died to myself. In that moment I felt a large weight lifted off my shoulders. I felt a peace. A freedom. A new life. I yearn to do this daily. It's a life long process. Do you want this as well? I believe in God, the Father almighty, creator of heaven and earth. I believe in Jesus Christ, his only son, our Lord. He was conceived by the power of the Holy Spirit and born of the Virgin Mary. He suffered under Pontius Pilate, was crucified, died, and was buried. He descended to the dead. On the third day he rose again. He ascended into heaven, and is seated at the right hand of the Father. He will come again to judge the living and the dead. I believe in the Holy Spirit, the holy catholic Church, the communion of saints, the forgiveness of sins, the resurrection of the body, and the life everlasting. Amen.